Perhaps the quickest way to junk up your shop is to dump boards and plywood scraps into corners, piled on the floor or onto that valuable work counter. 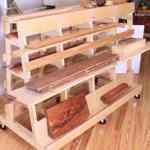 So rather than waste the space or you r time looking for that piece of wood you set aside to use later, get yourself organized with a rack like this one. Use it to hold sheet goods, full length boards, dowel and cut offs. A miscellaneous supply list is provided in the plan. Table saw, clamps, drill and other common shop tools. Carrying plywood any distance can quickly turn into a wrestling match, but you will win hands down when you use this mobile storage rack. And building it will not bust your budget either. This wall-mounted sheet goods lumber rack supplies maximum storage using a minimum of space. Great for shops with limited ceiling height, this rack stores sheet goods horizontally. This two module rack keeps boards and panels out of the way but always with arms reach. Modular design gives true size-it-to-fit versatility.